The most action associated with pipe smoking is probably limited to the elbow. 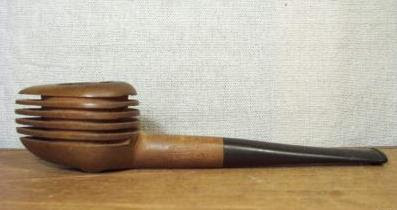 But this '40s streamliner pipe will make you feel as if you're relaxing at quite a clip. Woosh! Maybe it's best suited for country drives with the top down, not dark parlours. Regardless, it's a beauty. 11 hours left on the acution. Bids hover at $15.50. Bid away! Damn, missed it. That's what I get for not checking in for a few days. Would have made a great addition to the collection. Most of my favourites are French from the 40's... small face.